Welcome to another challenge from the Ribbon Carousel Blog! This months RCC Challenge theme is Love, Birthdays & Chicken Soup (be sure to add anything that comes on a spool to your project), continue reading below on how you can play along and enter to win a set of 10 spools filled with your choice of beautiful seam binding, baker's twine or May Arts ribbon! Inspiration for the challenge is posted every Tuesday Ribbon Carousel Blog! To created my card I used stamps and dies from Our Daily Bread Designs along with pattern paper from Bo Bunny. I stamped the canning jar from the Blue Ribbon Winner stamp set in Black ink on White card stock, then die cut the image using Our Daily Bread Designs Canning Jars Die. Using an x-acto knife, I cut out the oval portion in the lid, so that I could add the flowers. 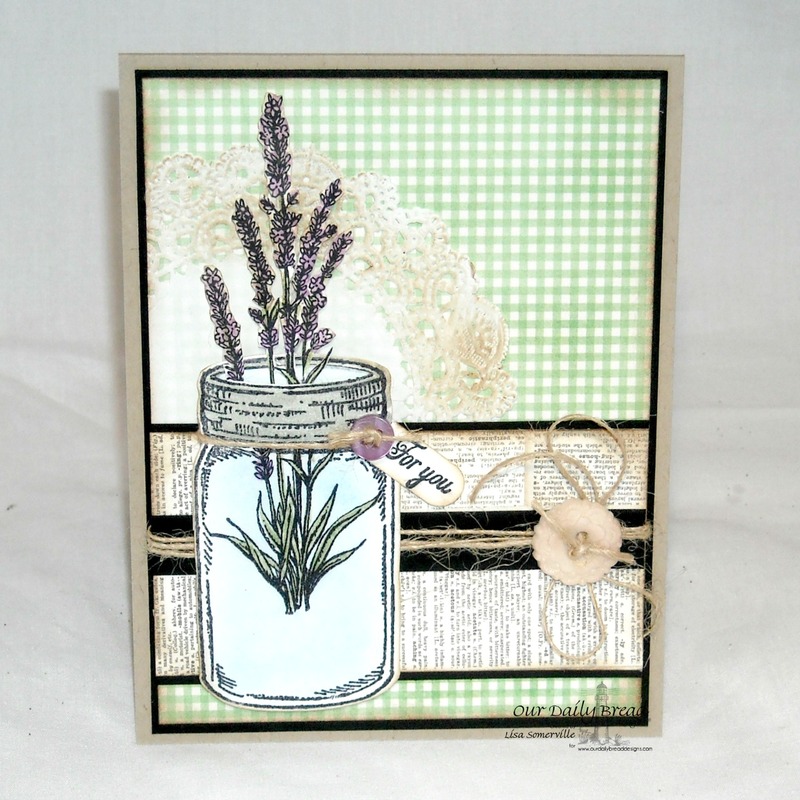 To stamp the flowers, I masked the canning jar with Eclipse Tape, then added the bottom portion of the flowers from the Lavender stamp set using a SAMJ for placement. I restamped the flowers on White card stock, cut them out, colored them with STAEDTLER Karat Aquarell Watercolor Markers and added them to the canning jar with dimensionals. The sentiment is from Our Daily Bread Designs Perfect Gift stamp set, stamped in Black on White card stock, cut with the Word Window punch and sponged with Ranger Gathered Twigs Distress Ink. To embellish I added a doily, buttons and Twine. To play along, simply create a project and be sure to include some ribbon or twine! You have until January 31st to add your creation to this post on the Ribbon Carousel Blog. One Random Challenge Participant will receive a set of 10 spools filled with your choice of beautiful seam binding, baker's twine or May Arts ribbon! The winner will be announced on February 3rd, on the Ribbon Carousel Blog! A beautiful card which reminds me of a country kitchen. Fabulous card, Lisa! Love the doily behind that jar and very clever addition of the flowers! Enjoy! This is so pretty, Lisa - the jar looks amazing, and I love the paper layers and doily in the background... and the twine too, of course! Oh, Lisa, so pretty! I just love these canning jars, and your fussy cutting with a craft knife was so worth it! It's fabulous and makes such a big difference! I love it! Sending warm hugs! P. S. And thanks for supporting this week's ODBD Shining the Light challenge! (I got to caught up with your card…I forgot to tell you! LOL!) Hugs! Beautiful card Lisa! The lavender look gorgeous! Well done with the fussy cutting!! Your card is so soft and beautiful Lisa!! I just love the green gingham and the placement of the lavender in the mason jar. Beautiful colors and design!! Thanks for sharing a sample for this week's challenge. It is so appreciated! Awesome card, has a country feel! Very cool!